Careers Cost > How Much Does a PO Box Cost? A PO box, short for post office box, is a box that is located within your local post office and is locked at all times. The only people with a key are you and the employees of the postal service who deliver your mail to the box. If you do not have a mailbox or need another mailbox for business reasons, a PO box is a great way to receive your mail. PO boxes are also great for privacy since it does not use your home address. The cost of a PO box will depend on your geographical location and the size of the box. How much does a USPS PO box cost? On average, the cost to rent a PO box is going to cost anywhere from $2 for a small box in a rural area to as much as $35 per month for the largest box in a metropolitan area such as New York City. The costs will really depend on what size you need and where you live. To get an exact price for what your local post office is charging, this USPS.gov page can give you the exact figures from each city. These prices, as you purchase months in advance, can drop in price. We quoted PO boxes across the United States and included the quotes we received from the official website inside the table below. An extra-small box, for example, can fit 10 to 15 envelopes and measures 3 x 5.5 x 14.75. A small box can fit up to 20 envelopes or five magazines and measures 5 x 5.5 x 14.75. A medium sized box can fit up to 30 to 40 envelopes and measures 11 x 5.5 x 14.75. A large box can fit close to two and a half shoe boxes and measures at 11 x 11 x 14.75. The largest box, an extra large box, can fit five or more shoe boxes and measures at 22.5 x 12 x 14.75. The post office will give you one key. For every additional key that you want, it can cost anywhere from $3 to $6 key. The price will depend on your post office location. If you lose the key to your PO box, a re-key charge will be applied. A lock replacement and late payment fee of $20 can apply. You can apply for a PO box either online or in person. Regardless of which route you take, however, you will need to show two valid forms of identification, with at least one showing your photograph. Depending on the post office, some may only offer three or four of the sizes mentioned above. Since all of them vary, it is best to call ahead of time to see what they have to offer. To receive a PO box at a local post office, they are going to ask for two forms of valid I.D. Pieces of identifications can include your driver’s license, passport, insurance cards, voters registration, college I.D. and more. Some post offices may not have PO boxes available. Again, it is best to call ahead of time or even visit in person to see what they have. If they do not have anything available, you can either opt for a different post office or put yourself on a waiting list. When it comes to refunds, the post office can provide them; however, there are certain regulations and rules. For example, there are no refunds on 3-month leases, but you can get 75% of your money back within the first three months of a 12-month lease. 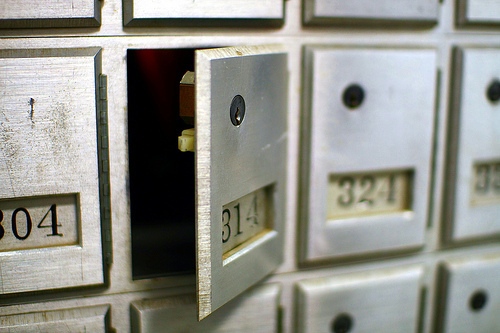 Although there are many advantages to having a PO box, there are also a few disadvantages. For example, there are many documents and formal processes that will not accept a PO box as a valid address. Having a PO box can also be inconvenient since you will have to drive to post office on a daily basis. There are many advantages, however. First, a PO box is a permanent address. This means that if you move or your business moves, you will not have to contact everyone to give them the new address. Secondly, a PO box is much more secure since you are the only one outside the post office that has a key. Your personal mailbox at home could potentially be opened by anyone passing by. Third, you are able to pick up your mail first thing in the morning rather than having it delivered to your home. If you are waiting for a specific piece of mail, you will be able to get it sooner. Finally, many post offices now offer to scan the outside of your mail so you can check online whether you need to go pick it up or not. A PO box is limited with the mail it receives. For example, UPS won’t deliver to a PO box and will only deliver to a valid street address. The longer you rent your box, the more you will be able to save. Typically, the post office will want you to sign contracts for three, six or 12 months. If you can drive the distance, consider post offices in less populated areas. These tend to be the post offices that can offer the best rates. Compare other local places such as the UPS store as well as mom and pop retailers. You may find that these places offer better deals than the post office.